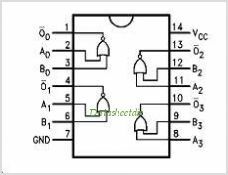 This device 74F02 contains four independent Gates each of which performs the Logic NOR function. This is one package pinout of 74F02,If you need more pinouts please download 74F02's pdf datasheet. 74F02 circuits will be updated soon..., now you can download the pdf datasheet to check the circuits!